Responsive web designs that work beautifully on all your devices. A good looking website is an investment in your business that creates a strong first impression with potential customers. It shows people you care about your products or services. I design and produce bespoke websites for small to medium sized businesses with simple, intuitive layouts that make it easy for your customers to access information. The latest web standards are applied with highly efficient code to deliver fast loading, search engine friendly websites for mobile, tablet and desktop computers on all popular modern browsers. Every website, whether big or small starts as a blank page and is unique for each client. I take time to understand you, your business and your customers to provide a solution that will help your business grow. 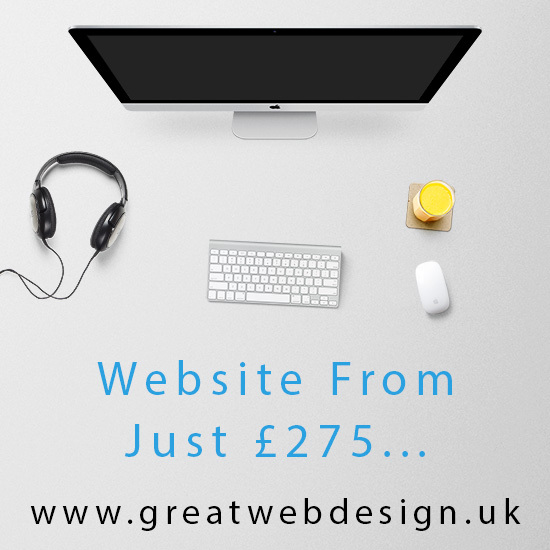 A four page brochure website design, SEO optimisation, plus 12 months free updates. A ten page brochure website design, SEO optimisation, plus 12 months free updates. A bespoke package is ideal when you need something like an e-commerce site, more pages or perhaps a content management system. If you have any web design questions please fill out the form below.